A Tuff Spot full of Gloop! Today we took our Tuff Spot outdoors and played with Gloop. Made simply by mixing cornflour and water, this strange mixture is sometimes solid, sometimes liquid, but always lots of fun! For each bowl of gloop we used one box of cornflour and one cup of water. I stirred some food colouring into the water before adding it to the cornflour, so we started off with one bowl each of red, blue and green gloop. We played outdoors with our gloop for the best part of two hours! I set the area up so each of the kids had their own bowl. They each made their own gloop (with some help mixing it when it became hard!) and they all played by themselves for a while, exploring the properties and experimenting with what they could do. Thomas was the first to get his hands in and really explore, and Ben wasn’t far behind but he wasn’t quite so sure at first. I knew Jasmine in particular wouldn’t be keen on getting her hands in straight away so I had brought some spoons and pots out so she could still get stuck in without getting messy! I also gave them some funnels so they could pick up lumps and watch it pour through. After a while the kids started to mix the colours together and explore what happened. They initially did this with little bits of each colour and Jasmine made some pictures with the different colours. Then the boys began tipping the gloop out of the bowls onto the Tuff Spot and really began playing with it. It was mud, it was a river, and a swamp. The dried bits that Jasmine was playing with turned into food for the animals that lived in the various places. We poured it into pots and as they overflowed they became fountains, waterfalls and volcanoes. We stopped the water and lava with our hands, then released it and watched it flow away. We drew shapes and letters in the gloop and watched them disappear quicker than we could finish drawing them. It was this drawing that finally got Jasmine to put first one finger, and then her whole hand in. Once she had done it once she did it over and over again. She loved it! My clean child, getting really truly messy with gloop. It was wonderful to see! 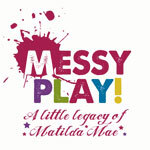 She has always enjoyed messy play. 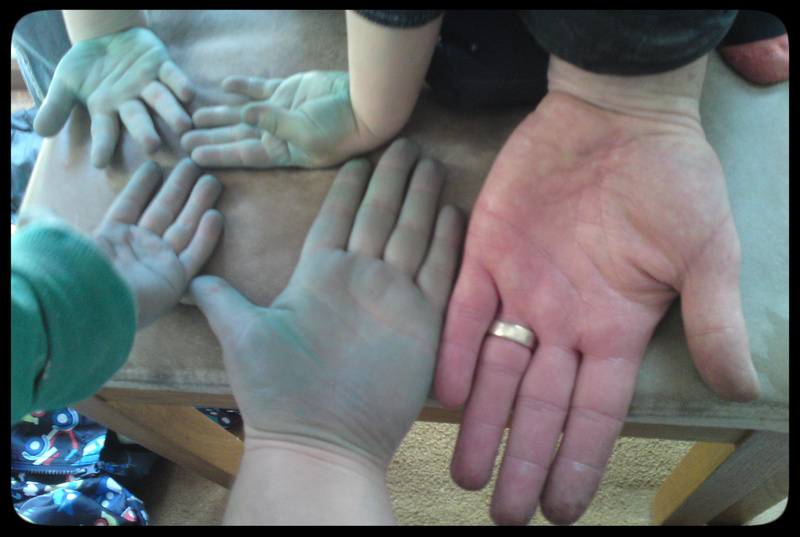 As a toddler she always got her hands messy and never minded, but as she has got older she prefers to be clean. Sometimes she just needs gently reminding how much fun getting messy really is! I have to admit, I had just as much fun playing with the gloop today as the kids did! I loved the way it felt when you picked it up and squeezed it between your fingers. I loved placing my hand on top and it being sucked down. I loved the way it changed during the time we were playing with it. The sun finally made an appearance today and so the gloop dried quite quickly once it was on the Tuff Spot. We kept adding more water so the consistency changed numerous times from very runny to, by the end of the 2 hours, quite dry. We frequently added dry bits back into the wetter bits and watched them become gloop again. 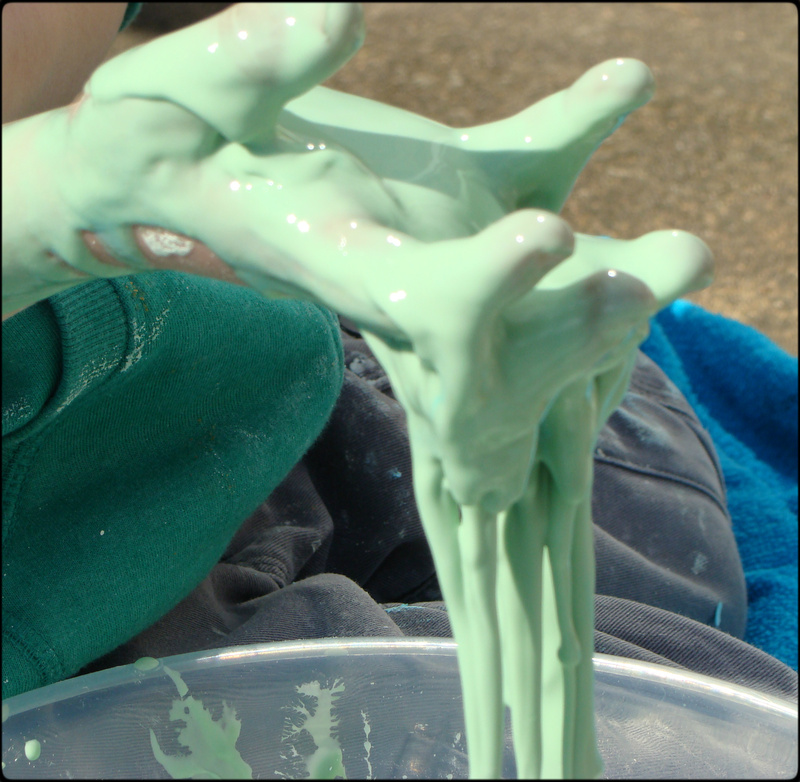 Gloop really is amazing stuff and we will definitely be playing with it again, even if it did turn us all green!